Every component inside the A Class subwoofers are optimized for each unique design. From transducers and cabinet architecture, to precision-tuned vents and crossovers, our team ensures that every element works at peak efficiency and in perfect harmony to deliver impactful and defined low frequency extension. As the flagship of the A Class subwoofer family, the formidable as-418 features four custom-engineered, 18-inch drivers into a compact enclosure comparable in size to most dual-18-inch subwoofer designs. 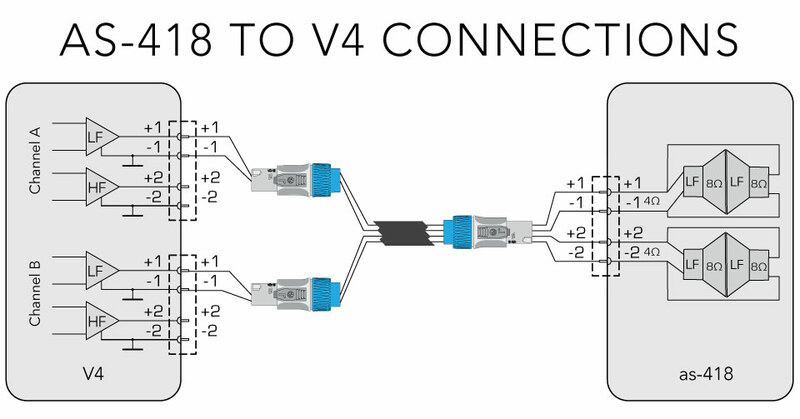 Drivers are configured into a pair of front-to-front, isobaric (push-pull) configurations. The direct radiation from each front driver is combined with the output of the companion rear driver in a tuned vented enclosure. This Compound Force design enables more output and less distortion than a typical dual 18-inch subwoofer, in the same footprint. 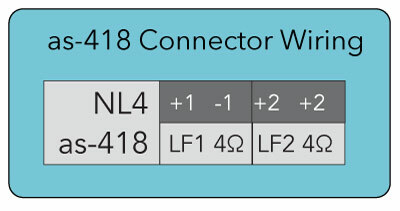 The custom-engineered transducers inside the as-418 are equally unique. Each feature a large, 4-inch voicecoil and ceramic ferrite magnet. Ceramic is a much better choice for subwoofer application where extreme excursions generate operating temperatures that can easily demagnetize neodymium components over time. By combining the large voice coil with a ceramic magnet structure, we increased power handling and decreased power compression, while ensuring reliable performance that would be consistent year after year under the most demanding conditions. The as-418 features a robust, multi-ply birch enclosure with extensive interior bracing and dampening materials to reduce unwanted flex and resonant frequencies. The cabinet is protected by a rugged, industrial grade polyurethane finish while the front features a protective steel grill with a water resistant powder coating. Integrated handles allow for easy portable use. All three basic types can have many variations including venting the rear chamber, loading the front into a bandpass chamber, to date VUE has employed the cone to cone isobaric type with a vented rear chamber. This design results in higher power handling, lower distortion, lower group delay, and requires half the enclosure volume for a given low frequency cut off as compared to a single non-isobaric vented design. As with all isobaric designs the drivers must operate in phase with each other, so in a cone to cone vented design each of the driver’s electrical drive signal is reversed to compensate for the reversed acoustic output. Developed in the 1950’s by respected acoustic engineer Harry F. Olson, the potential for isobaric loading to extract low frequency performance from a relatively compact footprint is well known. And while the benefits of isobaric technology are many, design complexities and the costs associated with increased woofer counts and power requirements have limited its wide spread deployment in favor of more traditional and less complex approaches. VUE has developed a growing range of isobaric based subwoofers that provide provide exceptional low frequency response form a relatively small enclosure using compound designs for applications where low frequency bandwidth and more accurate bass is more important than lots of pure output and size. In the VUE al-4SB the use of dual 15-inch divers in a isobaric configuration enables of a very small enclosure (required to match the array footprint of the subcompact al-4 line array system, while providing response down to 45 Hz and twice the power handing of a similar sized single 15 inch system. 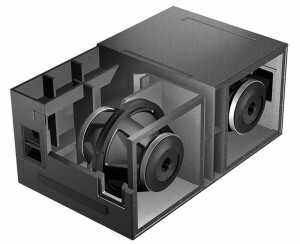 VUE has developed a growing range of isobaric based subwoofers that provide provide exceptional low frequency response form a relatively small enclosure using compound designs for applications where low frequency bandwidth and more accurate bass is more important than lots of pure output and size. In the VUE al-4SB the use of dual 15-inch divers in a isobaric configuration enables of a very small enclosure (required to match the array footprint of the subcompact al-4 line array system, while providing response down to 45 Hz and twice the power handing of a similar sized single 15 inch system. With the as-418 the use of two pairs of isobaric dual 18-inch drivers provides response down to 22 Hz with better definition and more power handling in a smaller box than most dual 18 inch enclosures on the market. Design Approach The isobaric loading method involves the pairing of two woofers into a tightly coupled “iso-pair”. Typically the iso-pair are configured in a cone-to-cone or cone-to-magnet push-pull configuration, with a common body of enclosed air adjoining one side of each diaphragm. The woofers work as if a single unit, with the direct radiation from the front woofer combining with the output of the companion rear woofer in a tuned vented enclosure. The net result of isobaric loading is that the coupled pair produce the same frequency response in half the box volume that a single speaker of the same type would require. For example, if a woofer is designed for optimal performance in a 1 cu.ft. enclosure, one iso-pair of the same speakers can achieve the same low frequency extension and overall response characteristics in a 0.5 cu.ft. enclosure. Isobaric loading can be used within almost any enclosure type, including sealed, vented or bandpass configurations. VUE designers employ a cone-to-cone, as it’s the most compact, efficient, and therefore most practical isobaric loading method. This approach requires opposite cone motion, so the woofers are wired in reverse polarity form one another. The opposed cone motion has the additional benefit of cancelling any suspension non-linearities from the individual woofer (differences in inward and outward suspension control), further reducing distortion. The face-to-face or “clamshell” configuration as it is commonly called is the most compact and, therefore, the most practical isobaric loading method to use, considering the tight confines of the average automobile. This configuration also provides the beneficial side effect of canceling driver non-linearities. If there is one recurring theme in engineering, it’s that Mother Nature is lazy. She has made it a law that anything at rest wants to stay at rest, and, similarly, anything in motion would much rather stay in motion in a straight line. Such is life in general, and a speaker’s dynamics are no exception. It’s called the law of inertia, and there is no escape. 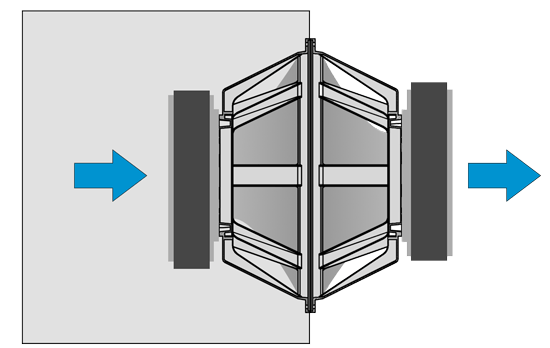 When a subwoofer does its job, it is called upon to compress and rarefy the air in the listening environment many times per second, and more often than not it is required to do so over great distances. This places a great strain on the cone itself as it fights to retain its shape in the face of intense acceleration and deceleration. Ideally, a speaker’s cone would be infinitely rigid and wouldn’t deform under any circumstances, but this is not a perfect world a perfect world, and we have to deal with the consequences of fighting Mother Nature. As the cone pushes outward, it is somewhat flattened out as it attempts to kick-start the air in front of it into motion. Likewise, the cone is deformed the other way when the cone returns and attempts to compress the air in the subwoofer enclosure. The extent of this deformation is a function of the cone’s geometry, construction and the amount of power with which the subwoofer is driven. A good engineer will design his cones so that this effect is minimized, but there is only so much engineers can do if he wants to keep moving mass and/or costs low. The flagship of the a-Class subwoofer family, the formidable as-418 installs four custom-engineered, 18-inch drivers into a relatively compact enclosure comparable in size to most dual-18-inch subwoofer designs. 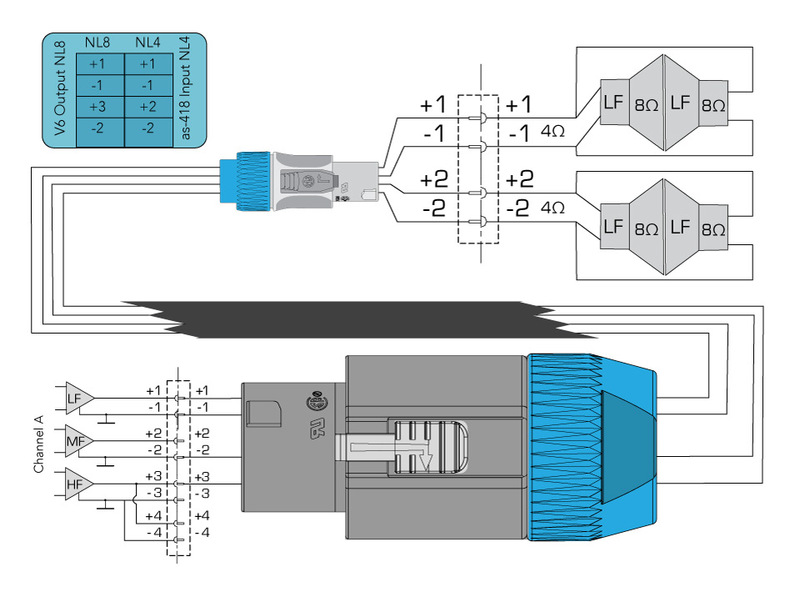 Drivers are configured into a pair of front-to-front, isobaric (push-pull) configurations. Each matched pair of woofers act as a single driver, with the froward facing driver in tandem with the mated rear facing woofer. Together they act like a single driver with twice the power handling and a much larger motor resulting in more control of woofer movement. It also produces lower frequency response as compared to the a single driver int eh same size vented enclosure. This Compound Force design enables very extended bass response along with more power handling and less distortion, in an enclosure no larger than a typical dual 18-inch subwoofer. The as-418 can be used to build directional low frequency arrays both in a CSA configuration and as end-fire arrays, to reduce energy behind the arrays. The V6 VUEDrive systems engine networked dsp/amplifier can power the as-418 and provide the necessary delay and signal processing to support low frequency arrays. In terms of bandwidth and power handling the as-418 provides better performance than a similar size dual 18 inch subwoofer. The as-418’s sensitivity (1w @ 1m output) is comparable to a dual drivers system while providing lower distortion and higher power handling, think of it as one of the world’s best dual 18-inch vents subwoofers that just happens to use four drivers to achieve maximum performance. The al-4SB is a suspendable subwoofer designed specifically for use with the al-4 Subcompact Line Array System. Benefitting from the same advanced isobaric loading found in our formidable as-418 subwoofer, the al-4SB extracts exceptional low frequency output from a compact and easily flyable package. When combined with an al-4 line array system, the al-4SB delivers powerful and well defined low frequency reproduction down to 45 Hz. 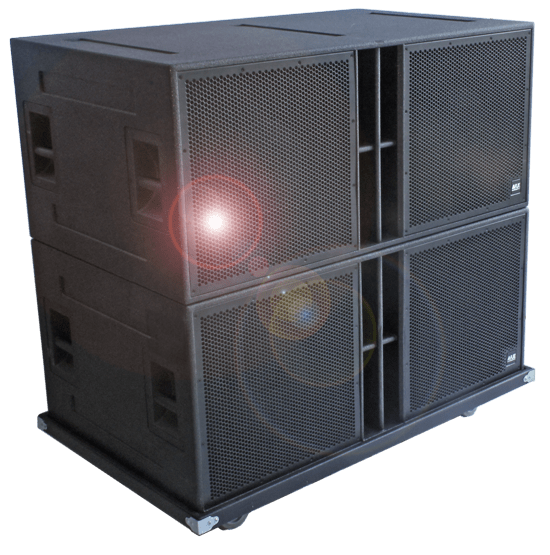 The isobaric design is key to enabling the al-4 to produce useful amounts of low frequency energy in an enclosure that matches the diminutive size of the al-4 line array system. Multiple al-4SB’s can be stacked or flown together to match space requirements and array configuration. We offer a special flyer that allows the al-4SB to be flown as an end-fire directional array to dramaticly reduce low frequency energy (-12 to -20 dB) to the rear of the array while maintaining full sonic impact (impulse response integrity). The ability to have a compact subwoofer system with no real sacrifice in performance is well worth the extra effort and expense. On the other hand, if you have a lot of space and are looking to get the maximum amount of output without sacrificing sound quality, using multiple iso-groups can give you the best cone area/box volume ratio while still retaining good fidelity.